Is it possible to achieve high quality metadata at the institutional level? A new ambitious METADATA 2020 initiative's belief is that investing in richer metadata* should be the scholarly community’s top priority. Good, satisfactory, open, connected and re-usable metadata reduces mis-communication and mis-interpretation, fuels discovery and innovation, bridges the gaps between systems and communities, and eliminates duplication of effort. Although metadata is considered to be one of the most powerful tools available in support of scholarly communication, different organisations are still standing in front of several problems related to receiving unsatisfactory or inadequate metadata from publishers which should be delivered to the different authorized institutional repositories. To create awareness and resources for all who have a stake in creating and using scholarly metadata, in September 2017 METADATA 2020 was launched. "One of the interesting ingredients for success in several current metadata projects is agreement across communities about what metadata are important for various use cases... We have collected recommendations from 10-20 organizations and communities as part of an NSF Project aimed at evaluating metadata collections in various dialects with respect to these recommendations. 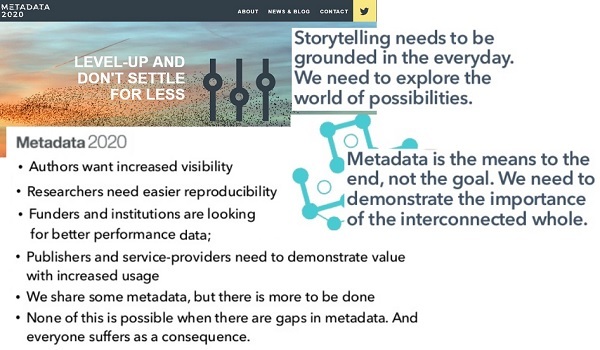 METADATA 2020 will demonstrate WHY richer metadata should be the scholarly community’s top priority, how we can all evaluate ourselves and improve, and what can be achieved when we work harder, and work together. METADATA 20202 will be offering many opportunities for GETTING INVOLVED involved: workshopping, listening, creating, evaluating, and developing. Let Metadata2020.org know how you can help. E-mail : info@metadata2020.org to stay in touch and get involved. "Having input, and feedback from all parts of the research ecosystem will be critical to Metadata 2020’s success, and participation is open to all", - the Scholarly Kitchen. * Metadata is data about data, information about information ... More comprehensive definitions address metadata as structured data supporting functions associated with an object, an object being any “entity, form, or mode”, - Big Metadata, Smart Metadata, and Metadata Capital: Toward Greater Synergy Between Data Science and Metadata.